Creative Blog Blogger Template is a 100% Responsive Minimal Blogger Theme that you can easily customize. 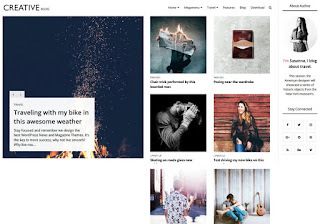 This best creative blogger theme features the Theme layout Options which is given in the Layout section of blogger dashboard. You can easily customize and edit this creative minimal blogspot template from the given Layout section, the best part is you don’t need to go into coding for doing most of the editing, for any editing you can do easily from blogger layout section.